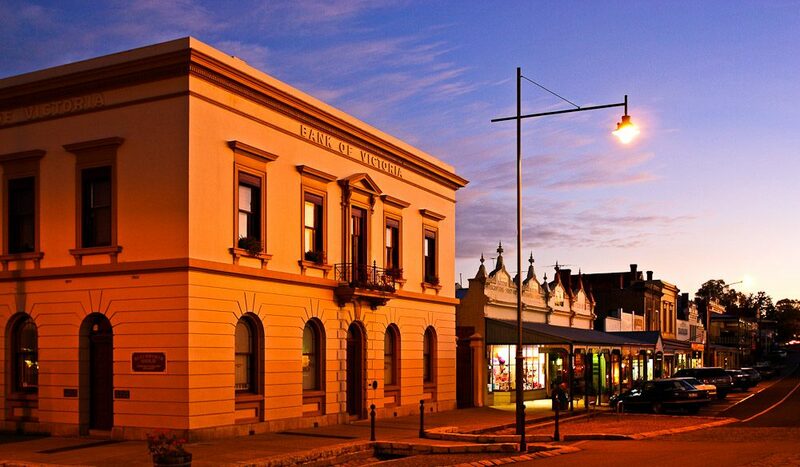 Beechworth is by far the best-preserved 19th Century gold mining town in Australia. Not a single building in the town’s centre feels 20th, let alone 21st, Century. The Beechworth streetscape is so instantly charming because the buildings were largely constructed in the same style, at roughly the same time, and with the same material – the local honey-coloured granite. Ned Kelly, the town’s most notorious loiterer, could ride into Beechworth today and, ignoring the cars and oddly dressed people, it would look much the same as when he left in late 1880. In fact, he’d probably be arrested and charged at the local courthouse for stealing the horse he rode in on. The courthouse retains its grandeur and original furniture, and visitors can stand in the same cell Kelly did before he was taken to Melbourne Gaol and hung. Beechworth’s current claims to fame are its growing number of microbreweries, the to-die-for range of Beechworth Honey, its regional fine food and the renowned Beechworth Bakery – Australia’s No.1 purveyor of piping hot pies, breads and cakes. Where? // 270km (3hrs) northeast of Melbourne. Did you know? // Robert O’Hara Burke was police superintendent in Beechworth from 1854 to 1858. Despite being well known for getting lost in the bush, he was selected to go on an expedition across Australia. Perhaps unsurprisingly, he and the ill-fated Wills failed to complete their journey of discovery, with Burke’s impatience and lack of bushcraft thought to be largely responsible.